Road trip! I’ve been in Texas for the last ten days. On Thursday afternoon w hen I got into Austin, my friend Nancy and I went off to her neighborhood cafe for dinner. What a treat! 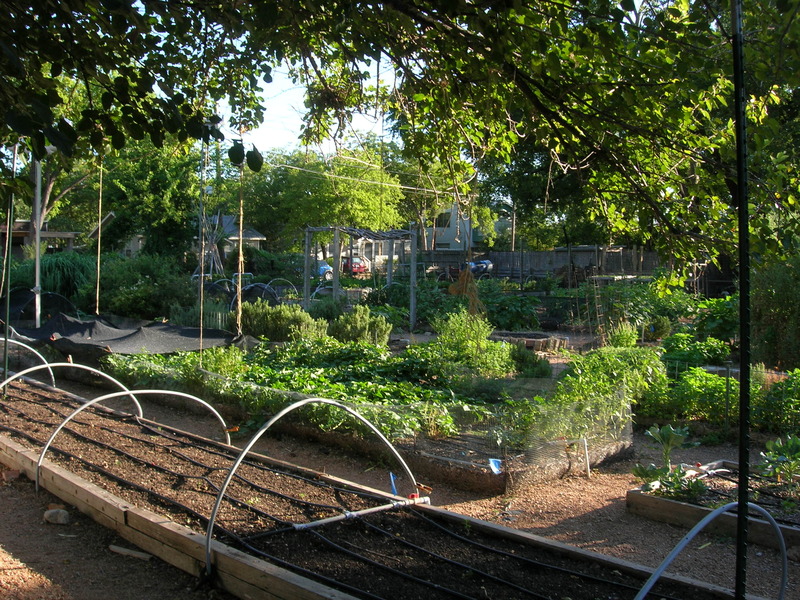 Eastside Cafe manages to re-create, in the middle of urban Austin, the farm-to-table experience some of us remember from our grandmother’s garden cooking. 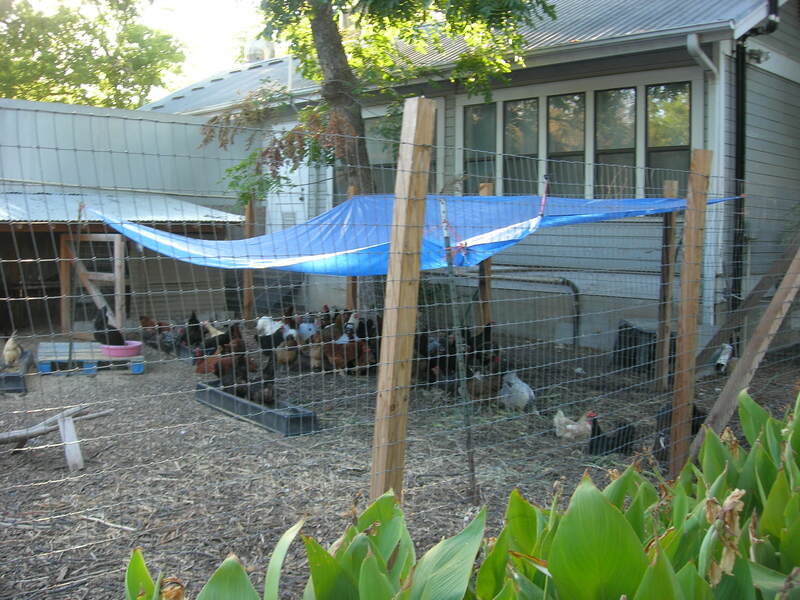 A lush acre or so of densely planted garden plots and a shaded chicken coop yield a harvest that travels only a few feet to the cafe kitchen, and then only a few more steps to our plate. My grandmother was a very practical woman; she marshaled her flowers and vegetables like a garden militia in straight furrows an acre long. 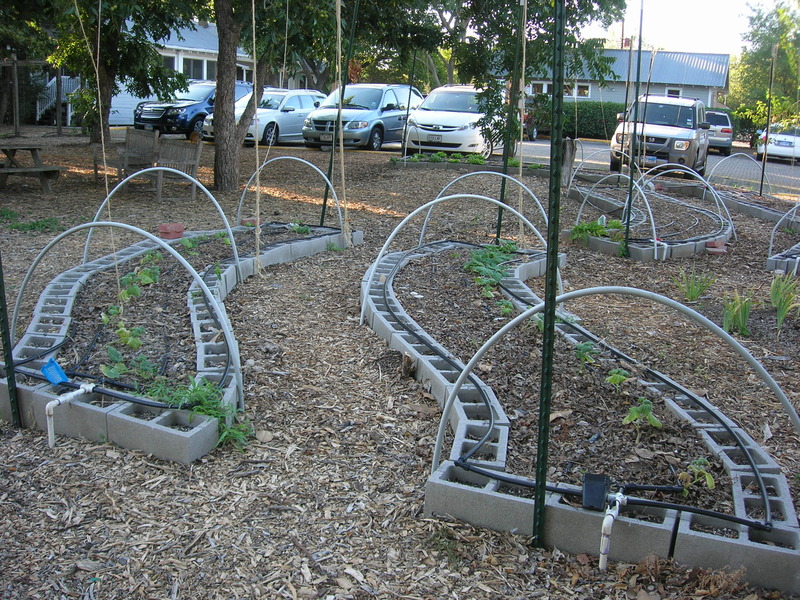 But the Eastside gardeners play!–Look how their plots swing along toward the parking lot, a little tipsy, about to lean on each other’s shoulders or brace each other on a hip. The menu incorporates the garden produce where it can, but also offers a wider range of beautifully prepared dishes. We started with a gazpacho (did I mention that it was over 100°, even at 7:00 in the evening?–a cold soup was a GREAT idea). 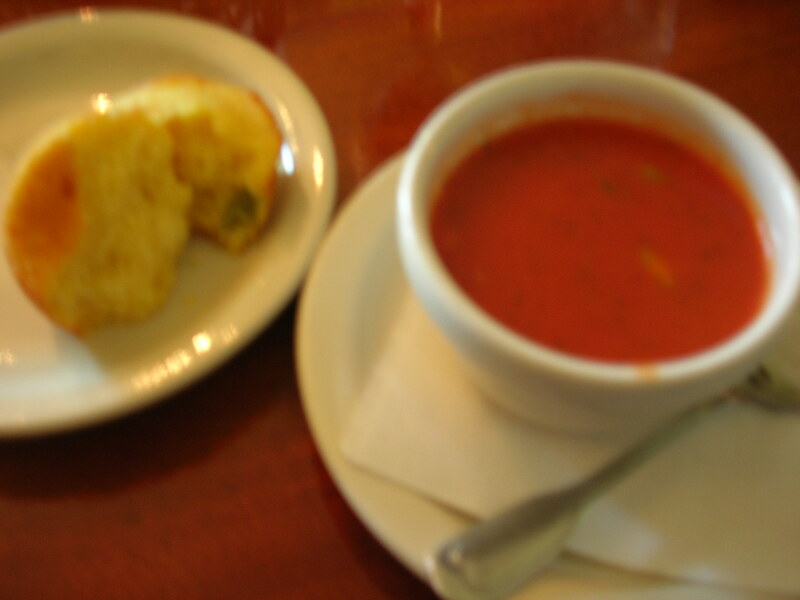 The corn muffin that came with it was light and crumbly–perfect. Nancy had the chicken and spinach crepes with a yellow curry cream sauce, served with apple chutney, broccoli with lemon butter, and mixed greens with a lemon tarragon vinaigrette. (I stole some forks-full; delicious!) 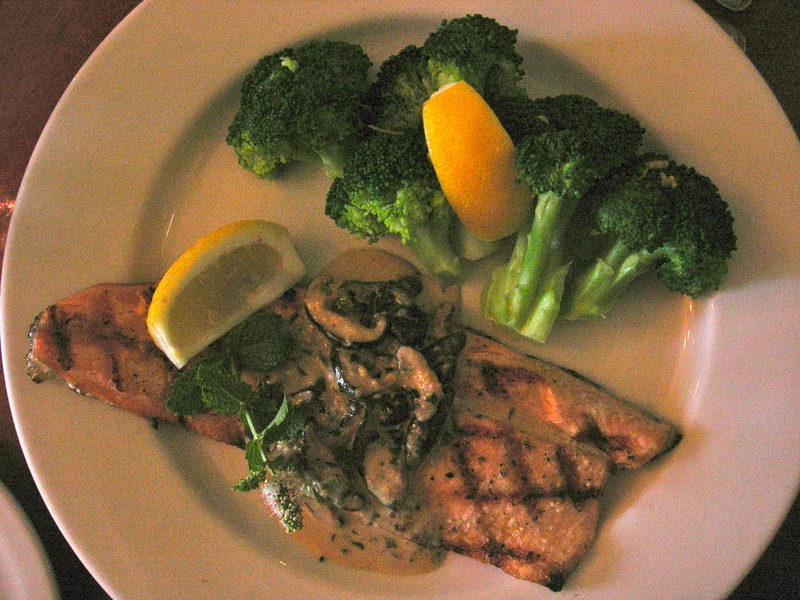 Because my body thought it was two hours earlier, I wanted a lighter supper, so I had the grilled Ruby Trout with shiitake mushroom ginger cream sauce. 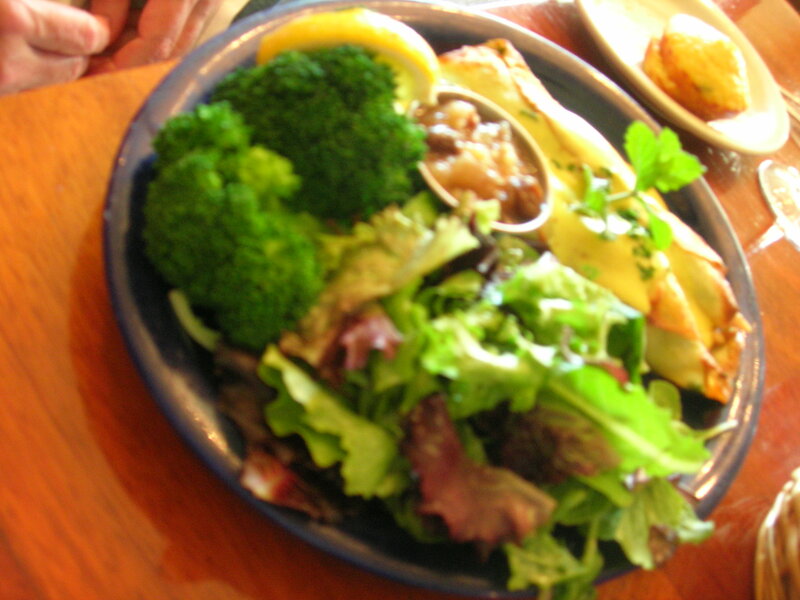 (It also came with the broccoli; plus, notice the mint leaves, straight from the garden.) Moist and flavorful–what a pleasure! 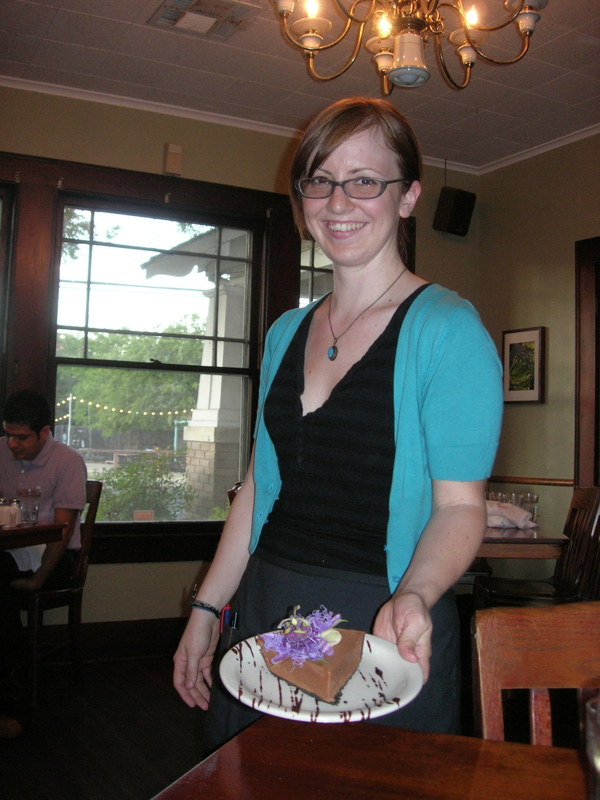 Once we looked at the dessert menu, it turned out that we had room after all–chocolate mousse pie, garnished with a flower from the passion vine growing out back. Our server was great! I made a note of her name, but I haven’t found it just yet; I’ll update this when I do. (This just in!–Courtney, known by the cafe gang as CC.) She was very pleasant and helpful (and knowledgeable about food blogs!). 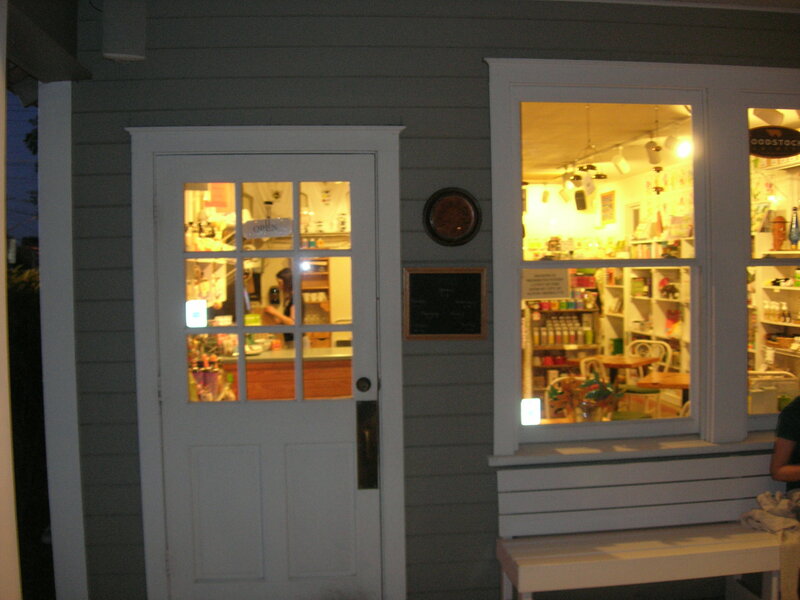 We didn’t stop by the gift shop, but if we had, we could have bought preserves and other products from the cafe’s garden. I’ve been to the Eastside Cafe several times now over the last decade or so, whenever I’ve found myself in Austin. I’ve never been disappointed, but this time I was especially pleased! And the word seems to be out; later that night, talking to an old friend about where to have lunch the next day, his first thought was “what about the Eastside Cafe?” Great idea! This entry was posted in Let's go EAT! and tagged Austin, Eastside Cafe Austin, farm to table, Texas restaurants by judyramey. Bookmark the permalink. This is my most favorite restaurant in Austin and probably in the entire state to TX!! My name is Allison Baron, and I am part of Eastside Cafe’s PR team. Thank you for this wonderful blog post– we absolutely love it, and we especially love your brilliant photos. I wanted to reach out to see if we could possibly use one of two of the photos from this post in an upcoming issue of the Austin Newcomers Guide, which is including Eastside Cafe in its dining section. We would of course give you credit for the photos. Please let me know what your policy is on this, and if this is something you might allow. Allison, I’d be happy for you to use my photos (and a credit would be very nice!)! When I come to Austin (less often now that my sister doesn’t live there, alas) I always turn up at the Eastside!